I am not a professional in the field of stitching, but according to my experience the best way to improve the design and design quality of the product should the usage of the commercial stitching machines that only requires the design as input and the rest work it does itself. I came across this question many times that "How to stitch the Large Embroidery Designs" or "Which hoop size you use for Large Embroidery Designs"
Please note that Question should not be about the hoop size but instead it should be about the type of machine used. You cannot stitch the large embroidery designs with home based Embroidery machine.This type of designs are meant for Commercial Machine only. The above Machine is Commercial Machine used for Large Embroidery Designs.The most popular multihead embroidery machines are 2, 4 and 6 heads. There are also 3, 8, 10, 12, 15, 20, 24 and 30 head multihead embroidery machines. Now, question may arise "What should be the hoops size of Large Commercial Machine, if i want to stitch the full Design". Again this question is diplomatic. There are various different kind of Commercial Machine are available like 250 area,500 area and so on. Size of hoops depend on your requirement. What is your requirement that is how bigger the designs is??? But this doesn't mean that you cannot stitch the large embroidery machine with out having specific machine. Like Home Embroidery Machine, where you use the large embroidery designs after splitting it, the large embroidery Machine can be used in same manner. Following two example will clear your doubt. But before moving to example please note that unlike home embroiderer, Commercial person always stitch in mass and are very much concerned with loss of resources. 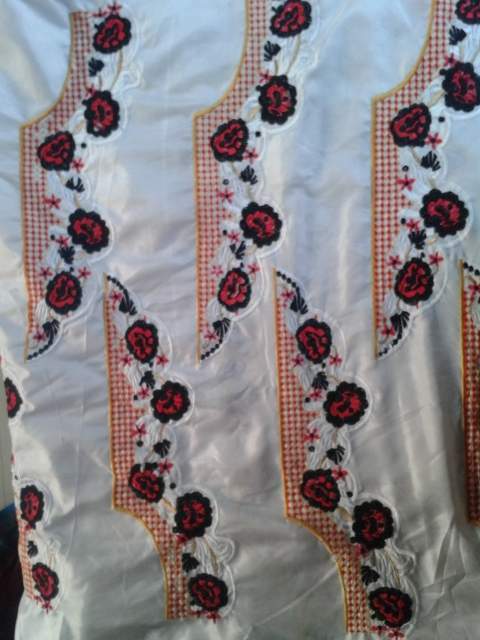 In the above image, since the size of the neckline is large, it is splitted in to two part.After splitting the Neckline, this designs is stitched by 12 heads large commercial machine in bulk.Generally Commercial person do not stitch one designs they stitch the designs in bulk as shown in above image. This will reduce the waste and the machine will be used to optimum. After stitch the designs in bulk, this designs are cutted down in different part and stitched together at the time of sewing. Final it will result in full dress. Now, suppose you want to stitch the full designs with stitching it in a part? 1) You must have the Large Commercial Machine with large hoop as per your requirement. This is the real answer to the question that "Which hoop is used by you for full embroidery designs"
Please note that there is no specific hoops size. You cannot change the machine every time with the change in designs size. There are the designs with 10 inches,20 inches,30inches in height. You cannot judge the hoops size unless you do not produce the standardized product. Now, generally we do not have such a big embroidery machine. Then how this designs is stitched? So how this designs are stitched? This Full Embroidery Designs are stitched by using a single head.It mean that only few head from total 12 heads are used to stitch this designs. So single head is used to stitch the full embroidery designs. Of course, now you cannot stitch the designs in bulk. In case of neckline designs, every head produce one designs, where as in case of full embroidery designs since the size of hoops is small, the size of another head is merged to make it large and thus it will reduce the number of designs produce. In simple term, 12 heads commercial machine will be equal to 12 single head machine. So if you use split neckline as per your hoop size then you will get 12 neckline designs, but if you want to go for full embroidery designs then in that case it will not get fit in single head machine. So you will merged another heads and stitch the designs by using single head only. The other heads will not be used. This may result in less efficient use of the machine. This is because, Machine will not use all heads and thereby the number of designs stitch will be low as compared to previous one. Further this may result in loss of resources too. 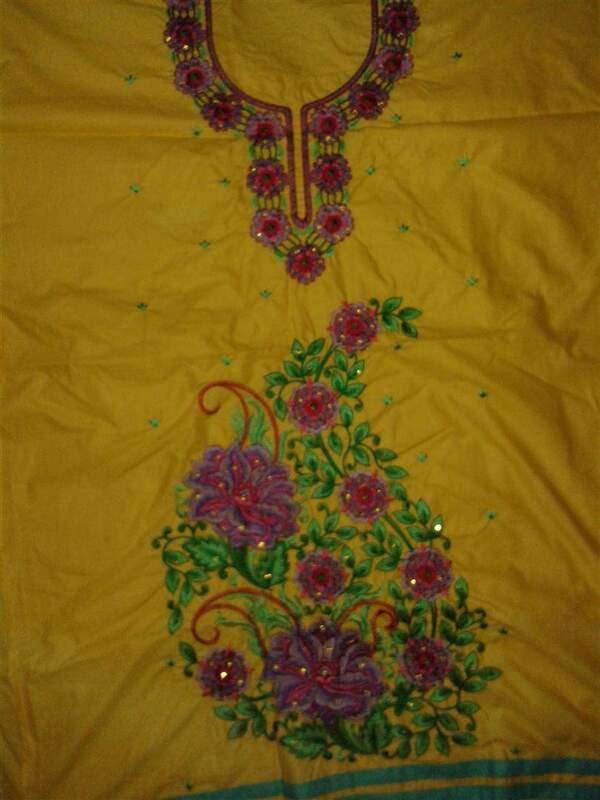 So, full embroidery designs is stitched by making some modification in machine. It is stitched by using single head only. So what will be the optimum size of the machine? Answer to this question depends on your requirement. What is your requirement. Of course, the answer to the question of selection between home based and commercial based embroidery machine can be answered with knowing your requirement. You must have the large commercial machine or use splitted designs. I get this video on internet.Just have look over this Embroidery Machine video. In this video you will find the working of Commercial Machine. By looking the size of machine you can easily say that this machine can be used for stitching the large full embroidery designs. At last, please note that in case of multi head machine, size is not measured in total, but instead hoop size is measured between the heads. I am not a professional writer, but i had tried my best to make you explain. I am not a experienced guys, i am still a beginner. You may correct me if i am wrong any where.